One of the more frequent fallacies you hear from monarchists to justify such a bizarre institution is that it helps maintain stability and constitutional government by placing the head of state above politics and above the reach of the people. The strict non-intervention of British royals in political matters does give the illusion of ensuring this but it is important to remember that this convention has absolutely no legal standing and there is little, if anything, to stand in the way of its suspension and the ability of the monarch to use her enormous political power - including choosing her government. So it has always baffled me why so many republics in Europe (there are 24 of them) chose constitutions which are essentially based on where ours found itself at some point in the nineteenth century. Like us, they have popularly-elected legislative assemblies from which the head of government and cabinet are drawn and which, in the absence of a monarch, also elects a politically impotent head of state. But the serious weaknesses in this sort of constitutional arrangement (which is favoured by Republic) was exposed last month with the toppling of democratic governments in Rome and Athens and their replacement with unelected 'technocrats'. Like ours, there is nothing in the Italian constitution which stipulates that ministers must be elected members of parliament or even members of parliament at all. And, while the Greek constitution stipulates that the prime minister must be a member of parliament, in the event of a prime minister's resignation (Article 38), its use of language is unclear about his successor. These glaring democratic holes were thoroughly exploited by eurocrats as a means of installing undemocratic governments favourable to their cause and it comes as no surprise that Mario Monti was once an EU commissioner while Lucas Papademos was vice president of the European Central Bank and governor of the Bank of Greece during that country's transition to the euro. Contrast this with the constitutional arrangements in France and the United States. These two revolutionary republics have heads of states that are elected by the people rather than parliament - an arrangement which stems from a muscular belief in those countries of the sovereignty of the people. 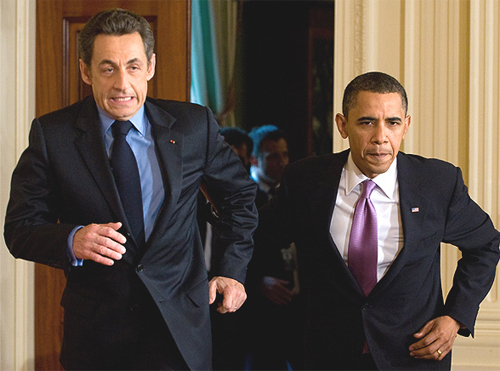 Now, I'm no fan of Nicolas Sarkozy or Barack Obama - they both represent the kind of corporatist capitalism I loathe - but you cannot dispute they are the people's choice and, because this is mandated in clearly written constitutions, they cannot be removed nor replaced by any other authority. There can, in essence, be no surer guarantee of popular and national sovereignty over foreign tyranny. In a nutshell, this makes what has happened in Athens and Rome impossible in Washington and Paris. It is, however, entirely possible in the UK - even more so, in fact, given that our want of a written constitution means it is pretty much whatever the House of Commons says it is. Do keep this in mind if you ever have to suffer the pontifications of a constitutional monarchist or, by the same token, if you ever feel the desire to support Republic.